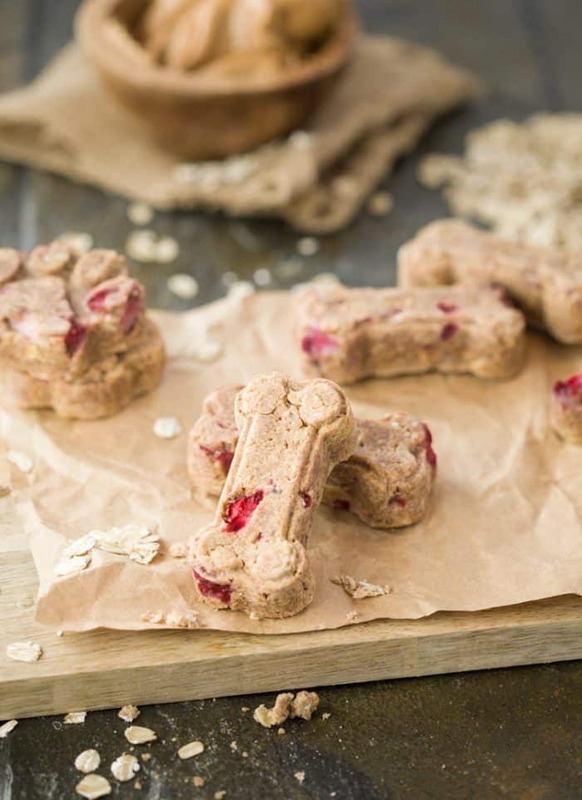 These homemade dog treats are loaded with strawberries, bananas, peanut butter, and oats. 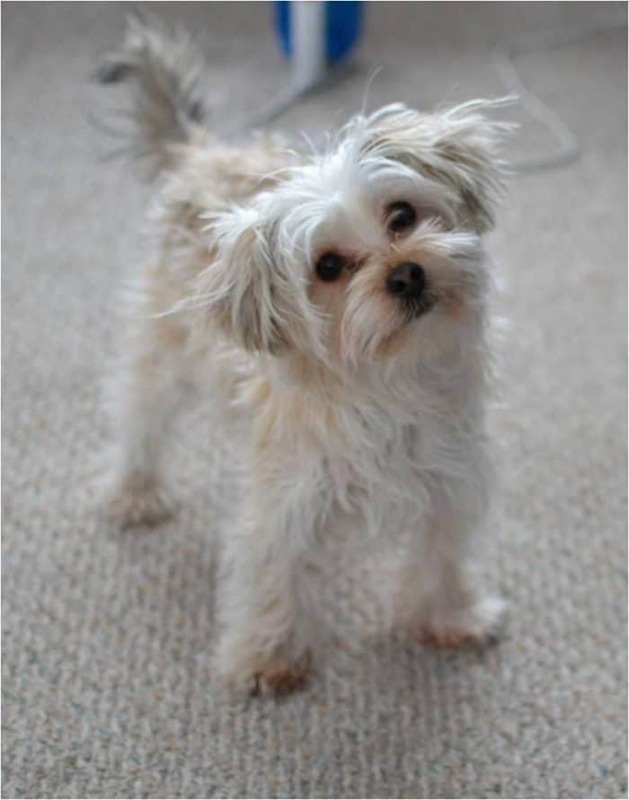 Everything you need to keep your dog happy and energized! Yes. Dogs can absolutely eat strawberries. They have lots of vitamins and minerals that are actually very good for dogs, but they’re also sweet, and should be served to dogs and puppies in moderation to prevent stomach aches. Welp, that settled it. 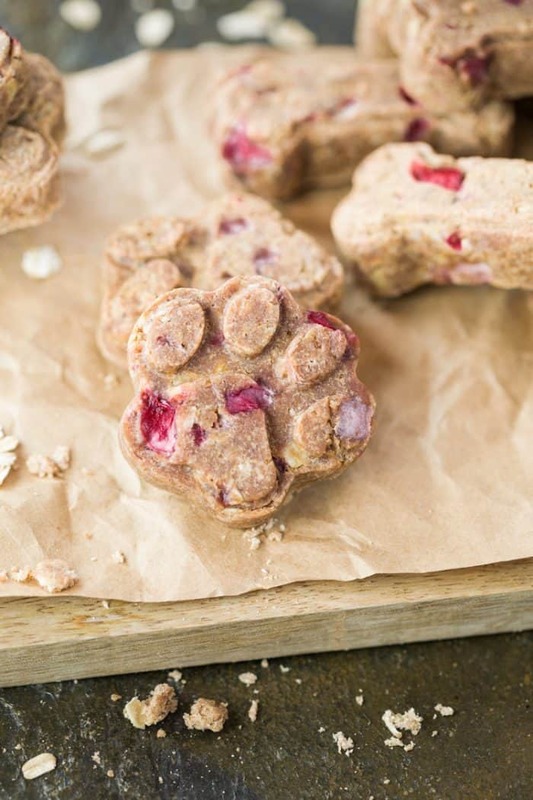 Homemade strawberry banana dog treats comin’ right up! These dog treat molds hold the shape perfectly, and makes the process even faster because you don’t have to roll out the mixture and cut shapes, (although you could)! Since Toby is just a little guy, I freeze the treats and take them out of the freezer one at a time, letting them come to room temperature before giving them to him. Then I just break off a piece after he does his business outside. Once I use the last bit of a treat, I grab the next one from the freezer. Pretty handy. How cute are these little paw prints?! 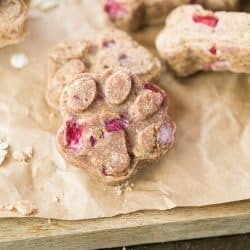 Between the little dog bone shapes and the paw prints, you can probably see why these homemade dog treats also make fabulous gifts! 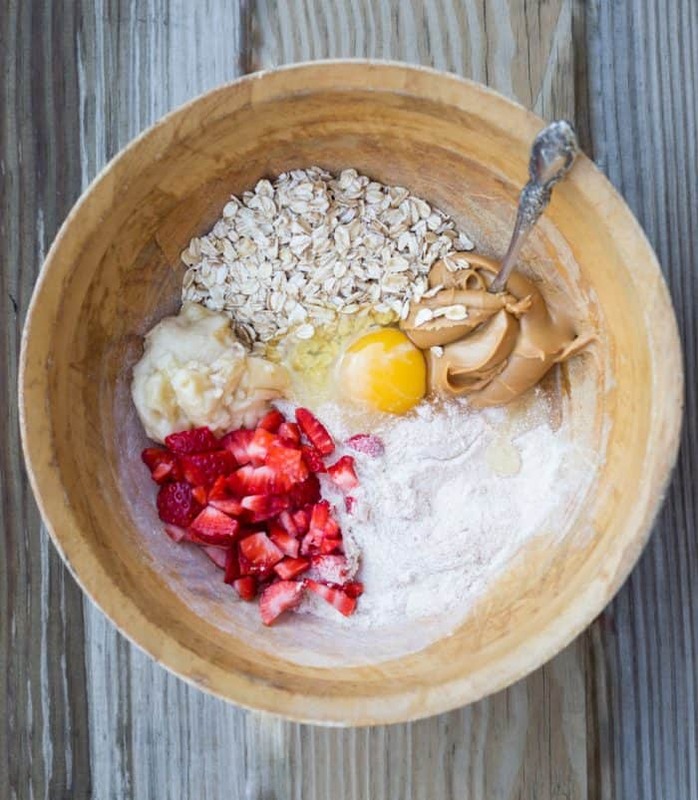 Combine all ingredients in a large bowl and knead until a dough ball forms. If it's too sticky, add a little more flour. Roll it out on a lightly floured surface and cut into shapes with cookie cutters or treat molds. I used these dog treat molds. Place the cutouts or the mold sheets on a baking pan and bake for about 20-25 minutes. Storage: These can be stored in an airtight container for 3-4 days, and can also be frozen until ready to use, at which point you may remove them and let them thaw at room temperature. Does it matter what kind of oats you use? I’ve recently started making homemade treats and dog food for my pup and want to make sure I’m not giving him anything his body can’t handle. Thanks! I’m about to make these as mini holiday gifts for all the pups in my family! Hi Emily! So sorry for he delay- I use old fashioned Quaker Oats! That is such great news, so happy to hear it, the heart cookie-cutter is so cute! Made these for my pup today. He loves them and I love the simple ingredients in them. I dont have cute cookies cutters so I just cut into small squares. I am going to look into fun shapes!! Hi, Om about to make these awesome cookies for my WinnieMoo, can I sub coconut flour and Oat flour, Winnie is on a no grain diet. And what ratio do I use? also missing the banana😏also I thought a little ground flax would be good? She loves them and even my family liked them (it’s human safe so why not try it). Coming from a non-dog perspective, they taste really good, obviously not sweet or salty, but for a dog, these are amazing. My dogs LOVED them. I might end up making these for friends when they get puppies or something. I just got an extra half cup of flour and kept incorporating it into the dough. I’m not much of a kitchen scientist, but they still came out amazing! How many treats will this recipe make? Hi Abby!! The top left of the recipe card has the number of servings, (just for future reference! )- This one made me 15 treats with the molds I used! Hi Linda, if you’re going to roll this out and create cuts from it before baking, I would suggest rolling it out maybe 1/2 of an inch or so. Amazing, our puppy loves them! Awesome Katie! I’m so happy to hear it!!!! Yay! !